The i2400 is a 30 ppm Duplex (Portrait, Scanning in Bi-tonal/ Grayscale) workgroup color scanner with a 50 page Automatic Document Feeder & advanced image processing features. 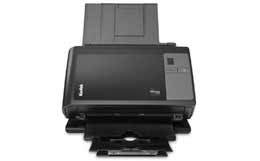 The i2400 allows for the capture of documents in Color, Bi-tonal or Grayscale. The Automatic Document Feeder (ADF) handles a wide range of document sizes and types (including ID Cards) with ease. you capture, manage, process, and deliver PDFs and other file formats, automating processes that previously were time consuming. Dual LED illumination gets you started faster by eliminating lamp warmup time to provide immediate response, plus image clarity, consistency, and color stability. Our extendable, self-storing output tray and ﬂ exible paper handling will take care of just about anything you want to scan — small documents or large, thick or thin, ID cards, even embossed hard cards. The highly reliable 50-sheet feeder and integrated paper tray make it easy to get scanning done.